The Climate Action Campaign is lauding San Diego’s efforts to slash greenhouse gas emissions but called reductions announced Thursday short-term, expected and due to strong state leadership on climate change. 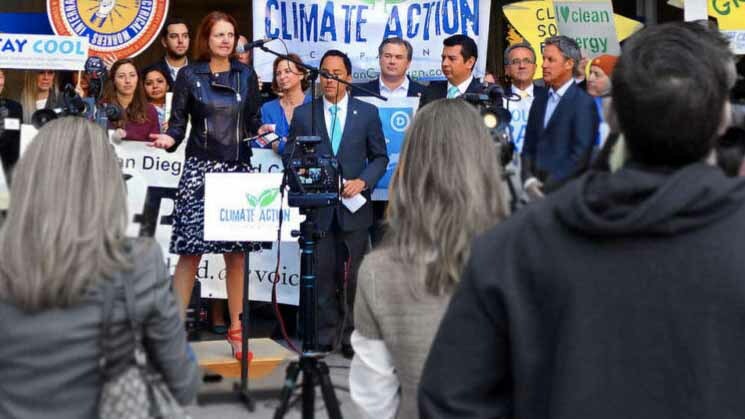 Nicole Capretz, executive director of the Climate Action Campaign, said: “We must remember, though, that the (Climate Action Plan) is a long-term, legally binding plan that requires immediate and bold local leadership to slash our carbon footprint in half by 2035 and protect our quality of life for our kids and families. Two major goals in San Diego’s plan to address climate change have been achieved, and other targets are close, according to a report released by the mayor’s office. The targets that have been met involve greenhouse gas emissions and water consumption. The plan, approved by the City Council in December, established policies in a variety of areas, set goals compared to a 2010 baseline, and fixed target years for when to meet them. According to the report, the climate change plan called for San Diego to emit 11 million metric tons of carbon dioxide equivalents into the atmosphere annually by 2020. Last year, the emissions were 10.8 million metric tons, below the target already and 17 percent under the baseline of 12.9 million. The 2015 emissions study was the first one conducted citywide since the 2010 baseline year. The blueprint calls for just 6.5 million metric tons of greenhouse gases in 2035. The plan also asked for a per-capita reduction in daily water consumption of 11 gallons, but the drop in 2015 was already 16 gallons, according to the report. “We’ve made significant progress to create a cleaner San Diego and we’re just getting started,” said Mayor Kevin Faulconer. Annual greenhouse gas emissions per capita decreased from 10 metric tons in 2010 to 7.9 five years later. 35 percent of electricity used citywide is generated from renewable sources, with a 2035 target of 100 percent. 64 percent of waste was diverted from the Miramar Landfill, 12 percentage points higher than 2010 and on the way to a 2020 goal of 75 percent. 75 percent of gas emitted from the landfill was captured, with a 2020 target of 80 percent. And 93 percent of methane from the wastewater treatment process was captured, compared to a hoped for 98 percent in 2020. The plan also called for a 15 percent cut in energy use by the city government by 2020. Last year, the drop was 6 percent.